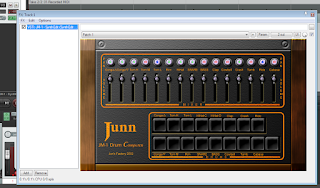 A friend suggested using a PC to play the drums through to get better drum sounds. Although at the moment I am not to fussed about the sounds he was going to come round to try the drums out so I wanted the option for him to use better sounds if he wanted. I now know there are two things that are needed. 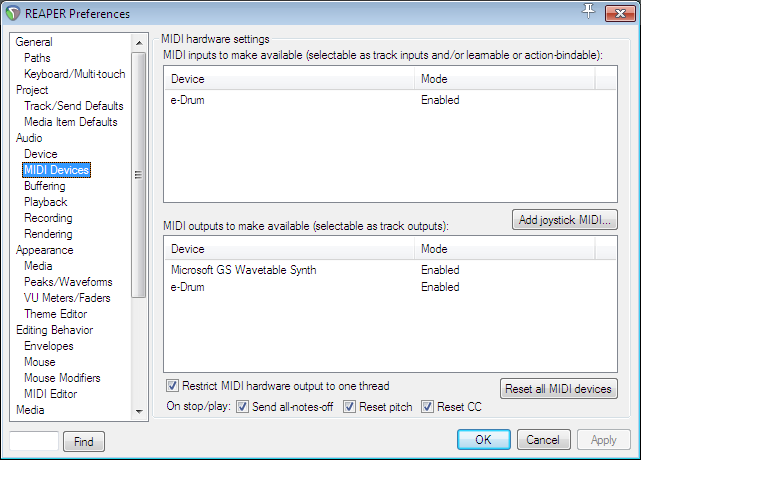 A Midi host application and the drum sounds themselves which ship using VST. For testing I am using some free sounds but eventually will purchase some good ones. Connecting the DD516 drums themselves to the laptop was easy. Plug the USB cable in and let the Microsoft e-drum drivers install. Took about 4 seconds. Job done no problems. 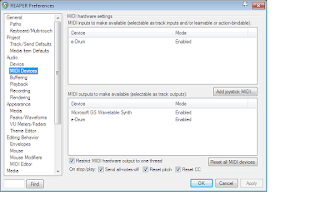 For the Midi host software there is a 30 day trial of an audio recording tool called Reaper. This is overkill for what I need at the moment but it was recommended. I found it was not straight forward to configure on the laptop I wanted to use. That's why I thought it was worth writing these instructions. It's an HD laptop with HD sound. To cut to the end I eventually worked out that by default the HD sound uses the SPDIF output first and then the built in speakers. For most of the config I could not get any sound out. I assume therefore that the SPDIF is connected to the HDMI output which I was not using! 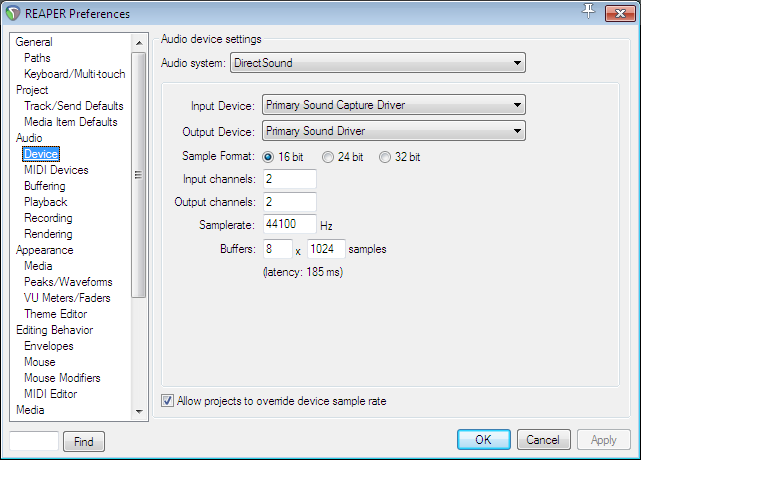 I first configured Reaper to use the Microsoft Direct Sound drivers. These worked but had a lot of lag. I'll come back to this in a minute. 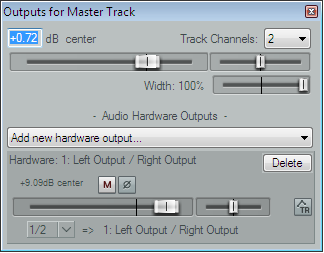 The first thing I found odd waht that by default the output of Reaper was to WaveOut. I have not looked in to what this is but no sound came out. The following are all in Reapers, Options - Preferences menus. Changed that to Direct Sound. Now select where we are playing from. Make sure the Midi or USB cable is plugged in to the laptop and the drum module is on. You must enable the e-drum input. The outputs are optional depending on what you are doing. Now we need some sounds to come out. Reaper does not come with any sounds. 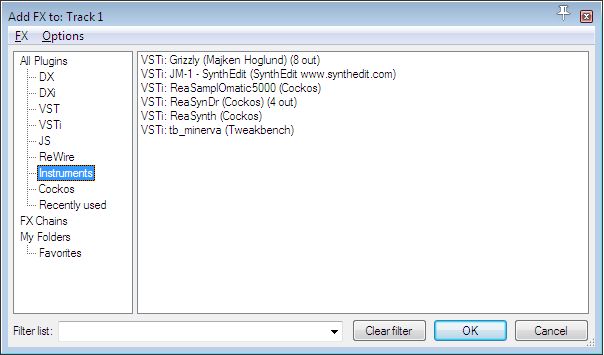 I made the mistake of assuming that the VST that was included called ReaSynthDR included sounds. As far as I can tell it does not. Make sure you download a VST that does have some sounds. As I said above I tried a few free ones. 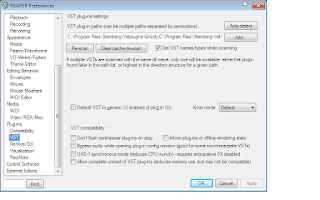 In Reaper move down the tree to Plug-ins \ VST. Add the above folder in using the button. This will scan and add any VSTs. 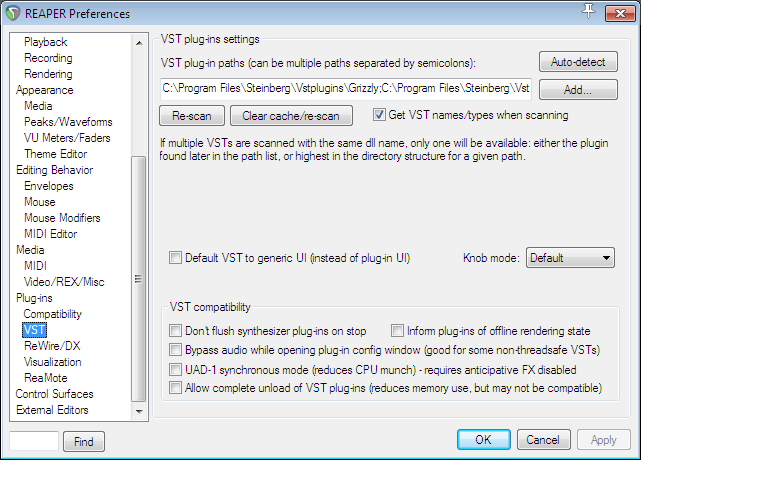 If you add more VST's use the Clear Cache/re-scan button. That's all the options done. Press OK to come out of that and back to the main interface. One bit that stumped me for ages was getting sound out. There is a master volume control. 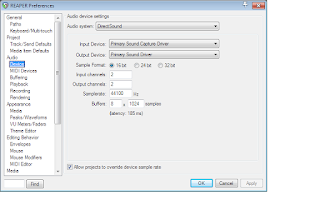 Press the small I/O button and configure the speakers as the output. Hopefully you can see by now why I struggled to get this going to start with. We are nowhere near finished yet! Now we add a track. Easy, New track from the menu. 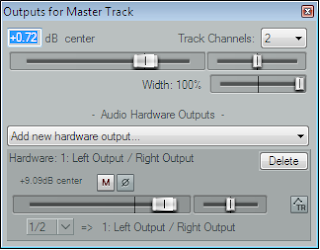 Set the Midi input using the simple drop down to All Midi, All Channels. This is just for testing. Now we need to get that track to use the sounds from the VST that we installed. Make sure you followed the steps above in the options and when you press the tiny FX button on the track you should get a page to Add an effect from a VST. 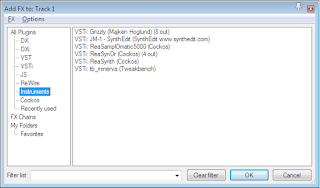 Select one of the VST's you have added yourself. You will then get that VST's interface added. Mostly the default setup will do something. So leave it alone for now. Press the cross to exit from that. One last job so we can hear something, turn on monitoring. Tiny green speaker symbol on the track in the Mixer section at the bottom of the screen. If you have accidentally or deliberately turned off the mixer, you can turn it back on again from the View menu. If I have I rememberred everything and you have followed all the instructions you should simply press the record button and start hitting the drums and the sounds will come out of the computer speakers. If you are anything like me you will not be impressed by the delay between striking the drum and when the sound comes out of the computer! I was told by my useful friend that I would need ASIO4ALL. ASIO was created to minimise the latency of audio devices on the PC. Download and install the latest version of Asio4All. Very quick. 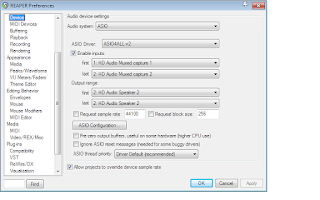 Once installed, return to Reaper and select ASIO as the Audio Device. The problem I had here is that again, I got no sound! I read the Asio4All manual and towards the end there is a note about SPDIF. Now the options in the manual and in the latest versions are not the same but using that information I changed the first speaker in the above settings to use speaker 2 instead of speaker 1. At last sound again. This time... When I hit the drums the sound comes out the PC without any noticable delay. 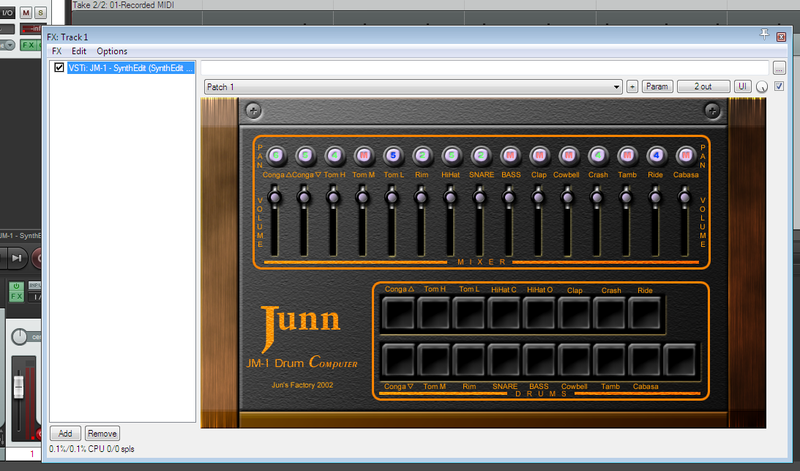 Now I just need to buy some fantastic drum sounds.